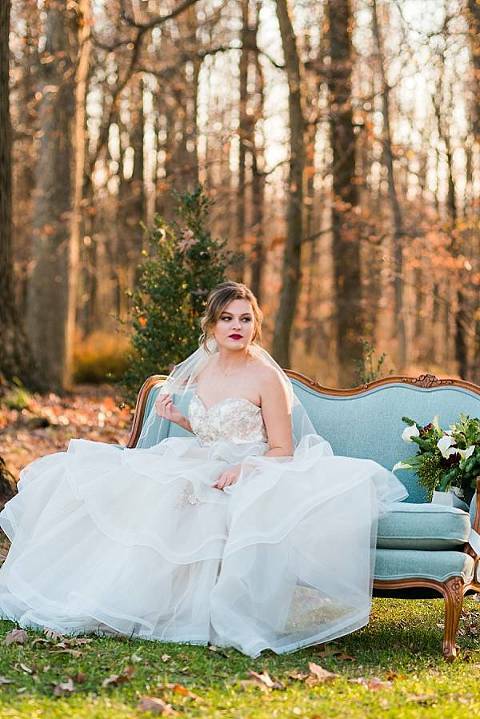 This Christmas wedding inspiration shoot gives us all the inspiration for a beautiful and elegant holiday wedding. This real life couple celebrated their marriage with this styled wedding, even including the bride’s sister as a bridesmaid. 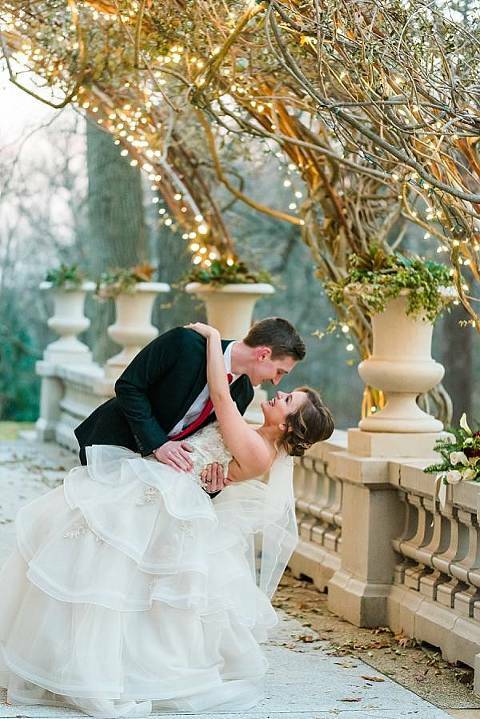 Designed by Heather Misner of Atwater Lane and captured by Ashton Kelley Photography, this Liriodendron Mansion holiday wedding reminds us that holiday themed weddings can be incredibly feminine and high end while still featuring the beautiful elements of the holiday season. The bride’s elegant style’s tone is set for a formal affair with a dress that features a sweetheart bodice, an asymmetrical organza skirt, and floral sequence accents. She’s wearing a gold choker with a single diamond pendant. Her look is completed with an up-do that features a soft side sweep bang, a hip length veil, and red lip to bring in that pop of traditional Christmas color. Having the groom wear a black tux coincides with the formal feel of the overall wedding. The red tie brings in the beloved Christmas color that’s featured throughout the whole wedding. The bridesmaid’s look features a sequined open-back red dress. The floor-length gown fits the evening affair. Her hair is finished with soft curls and a side braid. The bridal bouquet features all of the florals that you think of when you think Christmas. White calla lilies, red roses, evergreen branches, light peach roses, and holly berries and leaves. The mix of flowers creates a textured bouquet full of whites, reds, and evergreen. This elegant wedding inspiration stays with the traditional colors of Christmas – red, evergreen, gold and white. The beautiful and elegant invitations feature this Christmas color theme. Peach and Paperie‘s calligraphed invitations feature gold script and watercolor pine tree accents. Golden wax sealed the envelopes giving the suite a thoughtful finish. The welcome boxes are offered to guests that stay overnight or come from out of town. These boxes were created by The Welcoming District . These boxes stay with the winter theme offering carefully curated blue spruce scented candle, holiday-themed matches, holly tree coasters, a pine needle ink printed tea towel and a gingerbread bar of soap. The elements in these boxes are thoughtful and high quality ensuring guests will remember and enjoy the contents. The outdoor ceremony space overlooks the bare woods creating the feeling of winter. A geometric copper pipe archway defines the ceremony space. The archway is partially covered in evergreen branches and the sides accented with dark green flower vases full of poinsettias, evergreen branches, baby’s breath. Laying next to the vases are white birch wood logs. We love that evergreen, birch and traditional winter florals are included in this space. Guests can find their seats by use of the freestanding mantle. Adorned with two fur stockings, gold lanterns, white cranberry branches, wrapped presents and a welcome sign. The mantle continues to set the tone for the holiday-at-home vibe. The place cards hang from the middle of the fireplace on a red string and feature calligraphic names and watercolor floral accents. We love the uniqueness of this element for their wedding day. Say goodbye to boring tables and say hello to this stunning mantle! The Cake Studio created two cakes for inspiration. The main cake features a tall two-tier cake with a clean white fondant. It’s finished with a collection of pine needles, holly leaves and a light peach rose. The second cake is a one tier cake. It mirrors the first cake with fondant design but only features pine needles and cranberries. The cakes are complimented by chocolate covered “present” desserts, a mix of vanilla and chocolate cupcakes, an almond tart and star sandwich cookies. Everyone loves dessert, so this does not disappoint. An additional dessert table features cupcakes, petite fours, and cookies displayed on clean white trays and cake stands. They are accented with all the elements of the holiday: cinnamon sticks, holly berries and poinsettias. Of course, no wedding inspiration would be complete without a cocktail addition, which comes in the form of a Rose with a skewer of cranberries. Wooden tables and signs are adorned with holiday plates, and champagne with cranberries. Bottles of Rose keep in line with the color tones of the season and are corked with Christmas tree stoppers! Rustic wood sweetheart table is swathed with pine boughs, brass candle holders and an oversized table runner . A gold trimmed formal place setting reminds us that this is an elegant affair. The table is complete with a white lace runner which has been placed at the front of the table and left to drape off the sides. The runner is covered in fresh pine branches, holly leaves, poinsettias, and tall candelabras. Each place setting features a pink cut crystal glass and a gold leaf napkin ring (can I tell you how much I love these napkin rings!! ).